Grab your backpack and go! This workshop will help teach you all the essentials of taking a group of boys on a backpacking trip. Learn which supplies you need to bring, and which ones should be left behind! Everyone loves baths. Bath bombs - those delightful chunks of good smelling things that burst into a colourful fizz in your bathtub - make a normal bath turn into a fun sensory experience. Whether it's for yourself or a gift, this workshop will show you how easy it is to make homemade bath bombs. In this workshop participants will make a chalk painted sign. Each participant will go home with their very own sign. Knapping is the shaping of stone to manufacture tools. In this workshop we will go over the basic tools and techniques used through the ages and still used today. Join Certified Trapping Instructor Bill Davies, as he explains some of the rules and procedures of trapping. Participants will have a chance to see some of the equipment used, as well as the types of fur harvested in Ontario. Learn the steps required to turn metal and wood into a functional knife. Each participant will go home with a knife they made during the workshop. Having trouble with the game processing badge? Join Victor Melo, owner of Appin BBQ, as he describes the process of turning the pig cooked for lunch into usable cuts of meat. This workshop will help take an amazing Cake Pop design found on Pinterest and turn it into your very own personal creation. This is your chance to Nail It! This workshop will teach you the steps required to make a high quality PVC potato cannon. Each participant will go home with their own cannon. We will discuss ideas on how to easily speak about Cadets wherever we go. This can happen intentionally or sporadically— but if we show our enthusiasm it should happen easily. Come join us for support and for ideas in this ministry promotion. This interesting workshop is designed to show both Cadets & Gems how to make a rope from string or yarn. By making your own rope, you can use it for, Knots & lashing badge, cloths line for at camp, Tug of War competitions, ect. You can make any length, thickness you would like. Come see how easy it is to make your own rope making machine, ropes and the short process of doing so. Join former science teacher Josh DeGroot as he demonstrates several one night science experiments to help you lead the Science badge. From trees to fruit, flowers to vegetables, seeds are everywhere you look. This workshop will touch on the basics of seed identification, savings techniques and tips for growing from seed. No Sharkbite fittings in this workshop. Using the tried and true method of soldering build the CCC logo with copper fittings. This workshop best taken with the Woodworking Workshop to complete the craft. Do you sometimes wonder if the cadets in your cadre or your entire club do not show any spiritual growth? You jump start and get on some great thing and afterward there are no signs of any growth happening. 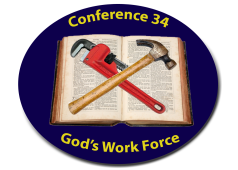 Well, here is a workshop where you can find some practical ways from the apostle Paul. Our relationship with boys is often built on the basis of the time we spend with them. We play games, we work on crafts, we teach them skills; just being there can mean so much. But do we think about the words that are involved? Words from a boy to a counselor. Words from a counselor to a boy. During this workshop we will hear stories to help us focus on listening skills, being compassionate with what we say, and coaching via speech. Looking for a thoughtful gift idea? Ever wondered how to make a tie blanket? No sewing required! Build a wood plaque to display the CCC logo you made with copper fittings in the soldering workshop.